My Wandering Life: Hole In One! Michael flew in from New York this morning and I asked Ben what special thing he'd like to do with just Mommy and Daddy. We went to the local Mulligan's where we were greeted by fourteen school buses. Uh-oh, we thought... it's summer camp day! Fortunately the buses started pulling out right after we arrived and we had the golf course to ourselves. 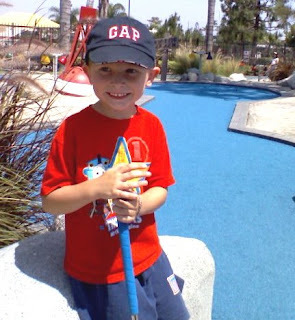 Benjamin was such a pleasant golfer, cheering us on, offering encouragement, and reminding us to take our turns. He got a hole in one about halfway through the course! Ben thought the day was a treat for him, but it was extra special for us because he was such a joy!